Those of us at the Tatting Corner are passionate about passing along the tradition of Tatting, an ancient lace making form that dates back to biblical times. This beautiful and lacey lace is a durable piece of history that can be passed down from generation to generation. I originally learned from my grandmother and now my daughter is learning the craft at the age of 8. For those who have always wanted to learn but don't have the family or connections, we want to be your tatting family and help you with the resources you need to learn. Many folks can and have taught themselves to tat. However learning the transfer sometimes is just so much easier with a teacher or a guiding hand. As part of our mission to help continue the rebirth of Tatting we are offering this page, a Teachers Page if you will. Our hope is that no matter where you live, you can find a tatting teacher, a mentor or a tatting guild nearby that can help. If you are an experienced tatter, lacemaker or crocheter who would love to mentor someone, or you are teacher for hire and would like to be listed on this page, please click the button above to submit your information. This listing is absolutely free. We hope someday to have representation from as many states and countries as possible. Hola! He aprendido tatting, hace poco, incluso para la realización de bijouterie, y para las primeras lecciones de principiantes. Si bien algunas de las profesoras que Uds. tienen hace año que lo practican, acá en Buenos Aires no hay nadie que de clases. Yo me ofrezco a enseñar en mi Ciudad. Vivo en el barrio de Floresta en Ciudad Autónoma de Buenos Aires. I am the President of the Tatters' Guild of Australia. We have tatting teachers who are available at the Epping Creative Centre, 26 Stanley Road, Epping, NSW, Australia on the 3rd Saturday of each month (except for January & December). Experience ranges from over 5 years to over 10 years. Please see our website for contact details www.tattinginaustralia.org. Anyone who would like to learn or improve their skills are most welcome. I am an advanced tatter with a strong passion for tatting and I am willing to share knowledge and be a mentor in the Calgary, Alberta area. You can contact me by email, bolinb@telus.net, or by phone, 403-282-3260. I am an experienced shuttle tatter and I would love to spread the love of tatting. I live in Victoria, BC on Vancouver Island. You can contact me by email, oclairedelune3@gmail.com. I also have a blog: oclairedelune.wordpress.com. I've been shuttle tatting since I was a teenager making booties to snowflakes and everything in between. Let me teach you how to tat so you can join in on the fun! I have been tatting since 1999 and teach needle tatting classes and workshops in my community and surrounding areas – from beginner to more advanced levels. I am the founder of the “Tatted Lace Artisans” – a monthly gathering of tatters in my community. I also demonstrate and teach tatting at craft fairs, sewing and quilting workshops, and fibre arts festivals. My book for needle tatters is currently being written and I am the designer and manufacturer of several specialty tatting tools. My Facebook page is Sparkling Light Creation Studio – contact me about classes, workshops, and demonstrations! I've taught myself to Knit, Crochet and Tat. I teach knitting and crochet classes, and would love to teach tatting as well! In the Downtown Toronto area. I live in San Jose, Costa Rica and I really love to teach tat. I learned this beautiful art on my own and with my computer. Because in my country tatting is not common, now I have been teaching and the ladies are so happy. With over 60 years experience in shuttle tatting and the patience of a "saint" I'm willing to try and teach anybody the original method of tatting (shuttle). No charges, except, perhaps, a cup of tea!!! I've only been tatting for 3 years but take it everywhere with and I'm a total addict. Would love to be able to help anyone or mentor. I'm a full qualified teacher of fashion, designm, art and history. Also of 315 various crafts including tatting. My main thing is Tatting :-) Been designing & teaching for over 20 years. Call 02086928637. I'm always happy to teach tatting, or talk tatting! I live in Ambala City,INDIA.I've been Tatting since 1982.When Iwas 14.I learned this most beautiful art my own struggle.TRY TRY AGAIN. At last I success. I am a shuttle Tatter with 32 years experience.Iam a self taught Tatter. I Love Tatting &I like to teach .I have a very easy method of teaching so it easy to learn. I also made own design and published in Hindi Magzine. In our country India has lost this art. I want to help keep the knowledge and skill of tatting going for generation to come.I am working in M.M.University Mullana,Ambala. (INDIA)In our University I had organise tatting exhibition.I am having ID on Facebook. Tatting or Chiacchierino is my preferred hobby. I live in southern Italy in the town of Apulia, a place where "the nature is color". Tatting is like "embroided air" end every doily resembles to the rosette of our medioeval cathedrals. I would like to teach tatting, to improve my knowledge and to keep in touch with people in the world that love tatting. I have tatted since I was a teenager and saw a shuttle in my grandmother's sewing basket. I have taught tatting through craft stores, the local university, and at Palmetto Tat Days, as well as individually. I would love to find tatters that are close by - beginners that are in need of instruction, or accomplished tatters in need of tatting companionship! I live in Mobile, AL, and have been tatting for 20 years, since learning at the City of Mobile (AL) Community Activities program. I quickly became obsessed and was editor of my local guild's newsletter for several years. I have written lots of patterns and can do or teach pretty much anything that can be (shuttle) tatted. I own a yarn shop in Mobile, called Mobile Yarn (www.mobileyarn.com), and teach tatting at my shop. I would be interested in teaching private and group tatting classes along the way! Contact me at heidi.sunday@yahoo.com, or call me at 251-308-2257. I have been a shuttle tatter since 2001. I have taught tatting on several occasions. I've been shuttle tatting since the early 90's. Self taught. If you want to learn, I want to teach you our lovely craft. You can email me, or call me at 650-515-2188. Tatting became my passion since the moment I learned in 2002. I'm a visual artist that loves teaching whatever I learn. The more I teach the more I learn and this is one of the most rewarding things I teach! Tatting gives an inner peace that helps with detaching from the everyday life while creating beautiful objects. I'm not teaching in a specific place but contact me if you would like some help. You can email me or call me at 310-740-4364. I live in Loveland, CO USA, have been Shuttle Tatting about 41yrs and taught tatting for almost as long not only locally but at Tatting Guild Tat Days and Rocky Mountain Lace Guild events. I now Teach Tatting at our Loveland Library on the 4th Saturday morning each month and have a drop-in Tatting Group there every Wednesday morning. I Teach Online Tatting Designers Classes on Tuesdays and have a Class Facebook page at https://www.facebook.com/groups/340190259328224/ , a Yahoo group for it at http://groups.yahoo.com/group/TattingDesigners/ a blog http://blog.tattedthreads.com/?p=5 and Pinterest Boards at http://pinterest.com/skdesigner/ I began designing tatting in the 1980s and published a book in the early 1990s A Potpourri of Tatted Patterns which is out of print but I am working on a much bigger revised version. Iâ€™m well-known for one of the patterns out of the book called Heartâ€™s Desire. I teach basic and early intermediate tatting. Students will successfully learn the basic stitch techniques and basic pattern reading with an emphasis on understanding both written instructions and diagrams. Students will make small example pieces in class that provide preparation for larger works. Discussions will also include the use of cordonnet and other thread types suitable for tatting, the history of tatting, and its relevance to today's styles. Books and patterns will be available for students to peruse from many different designers so that students can see the wide variety of styles, techniques, and beautiful pieces that can be achieved. Also covered will be various finishing techniques including the magic thread. Please contact me via email for particulars. I love teaching, and look forward to every opportunity to share this wonderful art. I know both needle and shuttle tatting. I teach shuttle tatting at the Fabric Art Shop in Lake City, Florida. I am also trying to establish a monthly tatting guild in North Florida where tatters can get together to tat and have a good time. My grandmother who raised me from birth to age 3 tatting. I remember watching as a young girl about age 10. She would tat so fast , it looked like a spider web. I always wanted to learn , but couldn't figure it out at the time. Later when I grew up, I tried teaching myself because I wanted to learn because my grandmother had done it, as mother had. I taught myself finally with help from a elderly lady who tatted beautifully . I have tatted about 30 some years and have taught about 200 people. I love teaching tatting. I live in Mooresville, Indiana in the Summer and in Melbourne, Florida in the Winter. Would love to teach anyone interested in learning. I am left handed, and I tat and knit both left and right handed. I also crochet left handed. Plus, I'm learning bobbin lace. So, if you are left handed, I can certainly help you. Shuttle Tatting Teacher - Sarasota, Florida Beginning to Advanced with focus on jewelry and ANKARS tatting. I sell my finished items of tatting-around hankies, ear rings, baby booties, on note cards, on tea towels, tiara, bridal veil. Also smocked dresses and bonnets for babies and little girls, Irish crochet roses on pillows. I live in Winter Garden, Florida near Orlando, Florida and teach tatting on shuttle or needle. I have been tatting for over 35 years (learned when I was 8) and would love to share the art and love of tatting. I can also be called at 229-256-3557. I have been tatting for 14 years and completed the Master level of the T.A.T. Proficiency Program. Experienced tatting teacher. Currently holding classes in Honolulu and Kailua. Hi, my name is Victoria and I am a needle and thread artist focused on 3D floral design patterns. In 2015, I discovered Igne Oya, which translates to crochet flowers or needlelace flowers. As someone with sensitive skin, I wanted to find jewelry pieces and accessories that were hypoallergenic. After owning a few pieces, I decided to take it upon myself to learn the technique to make my own patterns and style of handwoven lace jewelry. The art in its purest form only requires needles, threads, and sharp scissors. This type of jewelry has to be made by hand because of the intricacies and sculptural nature of lacework. Everything from the flowers to the details are done by hand with a fine tapestry needle and the best Egyptian cotton thread or metallic threads. Floral pieces can take a few hours to a few days to finish and consist of hundreds of tiny knots to form handmade lace. Part of my mission is to grow a community of admirers or crafters interested in the artistry and craft of needlelace. This form of art is new to the English-speaking world and I would love to share my knowledge of needlelace techniques. I teach locally in Chicago, and can also do virtual sessions with anyone who speaks English. I have always loved making lace. I have crocheted lace doilies, clothes, bookmarks, blankets, you name since I was 9 years old, almost 50 years. I learned to tat just a couple of years ago and quickly fell in love with it. I have made doilies,bookmarks, edgings, and bridal garters. Last, I know the basics of bobbin lace making and still am learning myself, but would be happy to get someone started and we could learn together. Author of several books on tatting including "A Little O' This, A Little O' Tat", "Motifs for Marie", and "Oh My Stars! Techniques for Tatters". I learned to needle tat in 2000. I would be willing to teach or help anyone in my area to learn how to tat with a needle. My Grandmother (Victoria) tried her best to teach me tatting at the age of 12. Her left-handed approach and my right-handed abilities didn't always mesh so I had a lifelong pursuit of becoming proficient. Thank Heavens for determination and for the help from Kaye Judt, our local expert, international instructor and author of several books on tatting. My grandmother, who raised me from birth to age 3, did tatting. I remember watching as a young girl about age 10. She would tat so fast , it looked like a spider web. I always wanted to learn , but couldn't figure it out at the time. Later when I grew up, I tried teaching myself because I wanted to learn because my grandmother had done it, as mother had. I taught myself finally with help from a elderly lady who tatted beautifully . I have tatted about 30 some years and have taught about 200 people. I love teaching tatting. I live in Mooresville, Indiana in the Summer and in Melbourne, Florida in the Winter. Would love to teach anyone interested in learning. I am a shuttle tatter with 30+ years of experience. My grandmother showed me the 'flip' and the rest has been self-taught. I also do some designing. I would be interested in teaching tatting to individuals or small groups in the Harvey county area, possibly Wichita, Hutchinson and Salina areas if arrangements can be made. You can see my work and patterns on my blog at http://wandasknottythoughts.blogspot.com/ and my Facebook page at https://goo.gl/h5OYIT. I am a shuttle tatting teacher. I also teach knitting, crochet, and various other fiber arts. I have been tatting for 17 years and teaching for 16. I am willing to travel up to 50 miles for lessons, or you can come to my home, whichever is better for you. I am both a needle and shuttle tatter. I've been teaching tatting for over 10 years and I participate in several costumed craft shows each year. I also design and sell tatted jewelry. I teach through a couple of venues locally. Mountain City Traditional Arts in Frostburg, Md. and Millicent's Yarns & More in Cumberland, Md. I will also do one-on-one through our gallery in Frostburg. I learned to tat from my father who was a mechanic. He could make the most beautiful and delicate lace with his fingers. I wanted to do just like he did. He learned from his mother when he was confined to bed with the measles for quite a long time and was bored. He made lace for my hats and collars when I was little and tatted several headpieces for bridal veils, including one for a lady in Japan. My father tatted the wings for an angel that I knitted the body and dress for and my daughter and granddaughter knitted the arms and legs. The angel was sent to Washington D.C. to be on the Christmas tree there and then auctioned. It turned out just beautifully. I owned a small craft supply shop in my town of Munising, Michigan and I was able to pass along my love of tatting to some of the ladies of the town. I am available to teach anyone who would like to learn if they can come to my house in Shingleton. I would hate to see the beauty of tatting die out when there are still people who know how to do it. I learned to tat in 1982 from my Grandmother. She taught me the basics. When we moved to Bemidji MN in 1996 I sat in on a Tatting Class. After that class we started the Northwoods Tatting Guild. I love to Tat and find it very relaxing. I have taken and taught a number of classes since then or if someone wants to learn we just get together. I do have my Tatting at Gallery North in Bemidji so that is a good place to hold a class. I also have some Tatting displayed on a table at the Minnesota Nice Cafe in Bemidji. I am located in the northern metro (Minneapolis/St.Paul) area, and have been tatting for about 10 years. I have started a casual tatting group that usually meets once a month for coffee and tatting. Beginners and experienced tatters welcome! I live near Rollag, MN which is south of Hawley. I have been tatting for years and my daughters are not interested at All. It would be a nice way to meet some more kids and kids at heart who still want to learn. I've been tatting since 1974 -- when I was 16 -- self-taught. I really want to help keep the knowledge and skill of tatting going for generations to come. I make edgings, doilies, bookmarks, decorative accents, etc. I live in the Springfield, Missouri area. I taught myself shuttle tatting in 1996 and have been teaching tatting since 2009. I have a unique method of teaching so it is easy to learn and transferring the thread is not a problem. Go to www.abctattingpatterns.com and click on "Classes" to see the latest offerings. I have been tatting for more than 12 years. I have taught various subjects for more than 20 years. I've been tatting since 1991 and have taught at several local needlework shops. I'm a member of the Shuttlebugs Tatting Club of Omaha. We are a chapter of IOLI and we meet monthly. Several of our members teach. New members are always welcome! I am a self taught tatter that has made everything from snowflakes, to jewelry to a shawl. I would love to teach others this beautiful art form. I use shuttles only. It's the perfect hobby to have on the go. I fell in love with tatting after finding a box of lace that my grandmother had made and finally found great instructions while living in England about 10 years ago. If you are in the area and want help with a project, send me an email. Taught to tat by my grandfather; my hobby is collecting ways to make lace. I'm a computer programmer by day; I bring logic to my lace and creativity to my code. i live in Port Byron New York. I have been tatting since 1974 i would love to help anyone learn tatting or help with reading patterns i will try at answer any questions, Email me any time. I learned to tat about 25 years ago. I started a tatting club in Rochester, NY, 9 years ago. I love to teach the art of tatting because I believe it is an art that should be passed on to the next generations. Our club meets once a month where we socialize, show off our tatted items, learn new techniques, and share patterns. I've been tatting since 1980. I've been published twice; won numerous awards at the NC State Fair; Member of the NC State Fair's Village of Yesteryear since 1999; voted Village of Yesteryear's Craftsman of the Year in 2007; taught at Palmetto Tatters' "Tat Days" in 2008, 2010 and 2012. I can teach the basics of shuttle tatting to your group of "tatter wannabees". I am located in the Wilmington, NC area, and will travel within a 25 mile radius of Wilmington to teach your group. For more information, please email me at geminidolly@yahoo.com or call me 910-599-8300. Please leave a message if I don't answer. I've been tatting for about 8 years and have taught others one on one and in a group. My best student is my older daughter, Paige. I taught her basics and she took them to a whole new level. We have one group meeting in Winston-Salem, NC, and one will be starting in the spring in the Kernersville/High Point area of North Carolina. You can reach me by phone above, or by email at megdeputy@gmail.com. Tatting teacher since 1996, beginner through advanced tatter skills, beaded tatting, 3-D tatting. I live in Canton, Ohio (north-east Ohio), and hold monthly classes at JoAnn ETC. in the Belden Village shopping area in addition to private lessons (usually at cafe or bookstore). Parma, Ohio - I learned shuttle tatting from my mother starting at about age 8. She had learned from my dad's mom who wanted to make sure the art didn't die out. After being thoroughly frustrated by my inability to pull up a ring due to my chubby fingers and sweaty hands, I finally was able to make presentable edgings by the time I was in 7th grade. Over the next 45 years, I taught myself double shuttle & ball & shuttle. I have no daughters to pass this on to. And while my sons picked up crochet & sewing, neither of them wants to tat. I'd love to mentor and/or teach anyone who wants to learn. I have taught tatting approximately 10 times over a 30 year period. I am seeking to supplement my income by teaching tatting, cost varying upon ages, distance, etc. I live in NE Ohio(Warren, Trumbull County)and have been teaching tatting and needlework for a number of years. I learned needlework at a young age and my first teaching experience was at 13. I have expanded my needlework experience over the span of 40+ years, first crochet, then embroidery, crewel, cross stitch, samplers, needle lace, spinning, knitting, and hand quilting. I have also lectured on a variety of needlework themes ie: samplers and their history, antique sewing tools, lace and it's history, Victorian needlework etc. I will travel to groups to teach tatting, needlework and/or lecture. This does depend on the distance, number of students travel costs and the weather. I try to stay local from November through March. My max for a tatting group is 7, my min is 3. For samplers my max is 16 my min is 8 and is negotiable for needlework, but not tatting. I will do follow up classes as needed, again with the above parameters. My goal is to have fun while teaching/learning a new skill. That is the reason we create with our hands. I also believe the best teachers are constant students themselves, striving to learn more and achieve the highest standards. You can contact me though email or Facebook at Cyndi Foore. I look forward to hearing from you. I learned shuttle tatting from Judi Banashek in 1995. I'm in Stillwater Oklahoma and I teach a beginner class online and am willing to help in person too. I've been tatting for 30 years and am always willing to help other tatters. We have guild meeting in Bartlesville OK and Kingfisher OK too. I have been shuttle tatting for over 40 years. Love to introduce new students to the world of tatting. I enjoy making projects of all sizes. I am available to teach private or group lessons. Drop me an email and we can discuss getting started on your next project. I've been tatting for close to 30 years, have attended the Spokane Shuttlebirds workshop almost every year, and have a working knowledge of the majority of the latest techniques and tips available there. I'd love to give classes to a maximum of 3 students at a time, the first 4 classes are $35 and $10 per class thereafter. I can teach basic tatting, split rings, split chains, beaded tatting, tatting with buttons and basic design. Hi,I am a juried tatter with the PA Guild of Craftsmen.I am a needle tatter-who is crazy about TEACHING. I would love to teach others how to tat-- However, I don't drive (I tat). You can probably figure out I won't go far. If there is anyone near me who wants to learn to tat...I am all about it. I live in Chester County about half way between Philly and Lancaster but close to Coatesville, Downingtown and Exton. I am located in Saxonburg, PA which is north of Pittsburgh, in western PA. Phone: 724-352-1441. I have been tatting for 3 years and have entered projects in the local Farm Show and have won ribbons. I do Shuttle Tatting just about everyday! Lessons are available day, evening and weekends. Hope to Pass on this Gentel Art. I have been tatting for more than 40 years but tend to enjoy the old fashioned patterns, not the ones written with "-" and "+". I belong to a group called Fiber, Threads & Knots. There are meetings in Hanover Gettysburg and Carlisle. Hello all, I have been shuttle tatting for a little over 35 years and teaching for 20 years. I teach Bobbin Lace, Tatting, Romanian Point, Irish Laces plus some embroideries and more at my studio in Waynesboro, Pennsylvania, where I offer professional classes for lace making. I also am the founder of our local lace making guild which in september turned 10 years old. You can contact me at shovelnose@embarqmail.com or 717-749-5071. I have been tatting for about 18 years. I enjoy it tremendously and have relished every opportunity to teach others, one on one or in very small groups. In 2011, my original design tatted silk necklace won a blue ribbon and the coveted People's Choice award in the lace category. I would be delighted to teach you to tat. I am a member of the New England Lace Guild. We are a frond off of the Palmetto Tatters Guild. Our local group is called Seaside Tatters. We meet the first and third Monday of the month from 4pm to 7 pm at Atlanta Bread on Rt. 544, in Surfside Beach, SC. If anyone has questions or visiting in the area they are most welcome. They can reach me at 843-449-2702 my home phone or 843-602-4245 my cell phone or via email at mbtatter@aol.com. We cover the entire Myrtle Beach area. We have people that come for the winter and we call them snowbirds. All are welcome. I also teach beginning tatting whenever the need arises. I teach needle tatting, crocheting, & quilting classes in Knoxville, TN. I also lead the Arts, Crafts, Teaching, & Sharing (ACTS) Ministry which meets twice monthly. Come learn, laugh & TAT with us! Newbie to experts welcome! Our tatting group is composed of never tatted to the State Fair of Texas Blue Ribbon Winner (4th straight year)! Let us teach you! We meet the 3rd Thursday of each month in Dallas, Texas (near Preston & Northwest Hwy). Meeting starts at 10AM and goes till our fingers get tired! No fee, parkings free, bring a snack/sack lunch, coffee provided. If you are interested in joining us please email for full details! Have been tatting for 4 years now. My tatting can be seen on my page, Facebook.com/tattingbox. I do not charge for teaching. I taught myself how to crochet by watching YouTube videos. I really enjoy it, and I even sell my work online. I also know how to knit and I do it occasionally as a hobby. It would be wonderful to teach these crafts to other people. I Live in Sugar Land, TX. I have been making lace and jewelry for years, by using different techniques such as knitting, crocheting, tatting, hairpin, etc. I am a shuttle tatter, I'd love to teach, beginner through advanced tatter skills, beaded tatting, 3-D tatting. Both needle & shuttle tatting; knitting (I am a master knitter), crocheting; quilling (without a 'T') I am happy to teach anyone who wants to learn; I do not charge for this service. All instruction will happen at The Yarn Bard in Cedar City. Our organization meets three times per month in different locations, and we are happy to teach new tatters, help others improve their technique, or learn new techniques and patterns together. Our objective is to promote the love of tatting. Our Ogden group meets the first Saturday of each month at the Pleasant Valley Library, 5568 South Adams Avenue, Ogden, Utah, from 1:00 p.m. to 4:00 p.m. The Utah County group meets the second Saturday of each month at the Corn Wagon Quilt Company, 303 East 400 South, Springville, Utah, from 1:00 p.m. to 4:00 p.m. 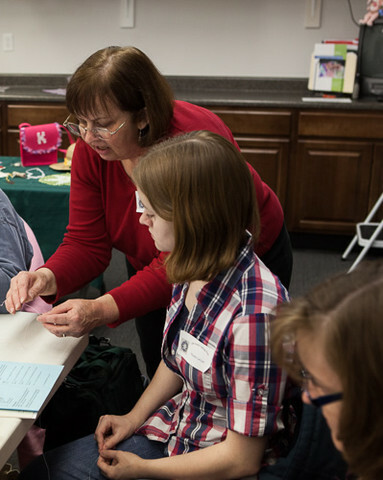 The Salt Lake Group meets the third Saturday of each month at the West Valley Library, 2880 West 3650 South, West Valley City, from 1:00 p.m. to 4:00 p.m.
New tatters and tatters of all skill levels are welcome. About 3 years ago I was given my first shuttle by a woman who was tatting at a craft show. Her goal was to introduce the craft to more people so we would not lose the art. It took me several months to learn the basics, and though I would not say I'm an expert by any stretch of the word; I am a competent shuttle tatted who would be happy to share knowledge with others learning to tat. Forty years ago, my amazing grandmother taught me tatting basics, providing me with tools, beautiful assortments of thread, her love of tatting,crochet, and knitting and, perhaps most importantly, the need to have my hands constantly busy creating some sort of needle art or craft. I teach all sorts of courses at JoAnn's in Woodbridge, VA (needle arts, beading, sewing, quilting, painting, et. al) and I also am the Director, Springfield Teaching And Resource Services (S.T.A.R.S. )where classes are scheduled for home school families and friends in many disciplines including needle arts. I am always eager to help others find their creativity by teaching important skills necessary to complete beautiful, useful needle art. I have been tatting for 12 years and teaching for the last 5. I teach regularly at Bird Tail Beads in Bellevue as well as other craft stores around town. I teach every year at the Shuttlebirds Tatting Workshop in Spokane. I can also do private lessons. I teach beginning through advanced tatting. Please send me an email if you are interested in learning the basics or have advanced techniques you'd like to learn. Happy Tatting! We meet on the first Saturday of each month at Lidgerwood Presbyterian Church, 4449 N Nevada, Spokane WA, from noon - 3:00 pm. All are welcome to attend. Our guild was started in February 1996 and we have members who have just learned to tat to some with 40+ years of experience. Our free tatting classes are held on the 2nd, 3rd and 4th Tuesdays of each month, (except April and December) from 5:30-8:00 pm at the church. The informal classes, designed for the beginner wanting to learn and/or improve on the basics, are open to tatters of all skill levels. I am a member of the International Organization of Lace (IOLI) and the Shuttlebirds Tatting Guild in Spokane, WA, and have been tatting for over 40 years. I am primarily a shuttle tatter, but can also teach basic needle tatting. I am a novice at bobbin lace and needle laces, but would love to share my passion with anyone who would like an introduction to these as well. You can email me, or call me at 509-279-5458. I have been tatting since 1974. I would be happy to teach classes if there is an interest in my area. I am currently teaching my 13 year old grand daughter how to tat, and have taught the craft to other women through the years. If you live in the Wisconsin Rapids, Wisconsin area & are interested in learning to tat, I would be happy to conduct classes and help you learn. My phone number is 715-213-2021 or find me on Facebook at: DreamScene Professional/facebook. Mentors / Teachers list. We very much appreciate your willingness to teach or mentor others and are very excited to add you to our list. We will review your information prior to posting it in case we have any questions. Again, thank you for taking time to join this elite group!